The Pakistani Taliban today targeted a Shiite imambargah with a powerful car bomb, killing at least 24 people and injuring nearly 100 others at a crowded market in northwest Pakistan's restive tribal region bordering Afghanistan. The blast struck the women's entrance of the imambargah in the remote Parachinar in Kurram Agency, sending the large number of people gathered for Friday prayers near the market into a frenzied run for safety. The blast - the latest in a series of attacks targeting the minority Shias in the Sunni-majority Pakistan - was so powerful that it completely shattered the car in which the bomb was planted and damaged several vehicles parked nearby. The site was littered with mangled vehicle parts and blood-stained clothes, TV footages showed. An eyewitness told The Express Tribune that security personnel at the Imambargah were busy checking devotees at the central Imambargah's entrance for women, when an unidentified person parked the car close to the building, and it then exploded. Security forces have cordoned off the site and emergency services were assisting local authorities. The administration has declared an emergency at all hospitals in the area. Author ties said the death toll has now been revised to 24 and a majority of the nearly 100 injured were stated to be critical. And 27 of the critically wounded had to be airlifted to hospitals in Khyber Pakhtunkhwa's provincial capital Peshawar. An army medical helicopter has been sent to Parachinar to evacuate the injured, said a statement from the Inter-Services Public Relations (ISPR) statement. 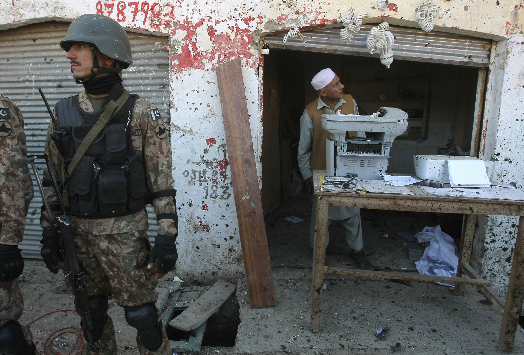 Hours after the blast, Jamaat-ul-Ahrar, a breakaway faction of the Pakistani Taliban, claimed responsibility for the attack in the tribal region, which was once a stronghold of the group and has witnessed several sectarian attacks in the past. Pakistan's Prime Minister Nawaz Sharif has condemned the attack and reiterated his government's resolve to eliminate the menace of terrorism from the country "at all costs". "It is our responsibility to continue the war against terrorists," he said. "The network of terrorists has already been broken and it is our national duty to continue this war until the complete annihilation of the scourge of terrorism from our soil." Interior Minister Chaudhry Nisar Ali Khan has ordered authorities to investigate the attack. Pakistan, a country of nearly 200 million, has lately been rattled by a number of deadly terrorist and sectarian attacks. Last month, more than 125 people were killed and another 300 injured in a series of suicide attacks across the country, including the one in Lahore and another on the popular Lal Shahbaz Qalandar shrine in Sindh. Pakistani security forces retaliated with a crackdown, killing dozens of terrorists and destroying militant hideouts along the border with Afghanistan. Pakistan army has launched operation 'Radd-ul-Fasaad' (elimination of discord) to defeat terrorists and consolidate the gains of its counter-terrorism operations across the country.